Who's responsible for tasty flour-confectionery products? 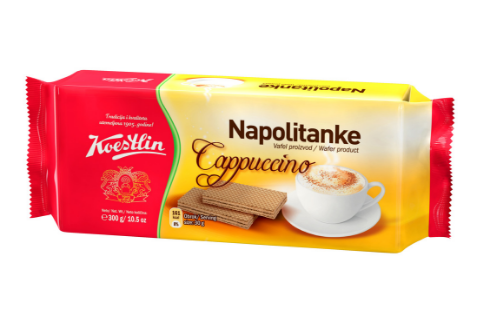 Koestlin is a Croatian company with a 100-year long tradition. Find out more about them! Have you tried to take your morning cappuccino without using a cup? This is the only dark wafer product. It has a specific taste and specific cappuccino aroma which makes it fit perfectly into modern trends and preferences of new generations of our consumers. Filling 70% [sugar, palm fat, skimmed MILK powder, chicory (1%), flavourings], wafer 30% (WHEAT flour, palm fat, fat reduced cocoa powder, emulsifier SOYA lecithin, raising agent sodium carbonates, salt). May contain peanuts and nuts.